Atteridgeville, to the west of Pretoria, was one of the few Black local authorities in the previous political dispensation to adopt a flag of its own. This was an armorial banner derived from the shield of its arms which were registered with the South African Bureau of Heraldry. The flag comprised a silver (white) lion holding a gold quill on a red background. Above are four upward-pointing arrows to represent the growth of schools, houses, shops and churches in the town. MOTTO: ACTA VERBIS CLAIRORA (Actions speak louder than words). 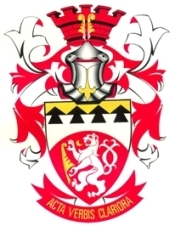 These symbols are no longer in use following the incorporation of Atteridgeville into the Tshwane Metropolitian Municipality in December 2000.